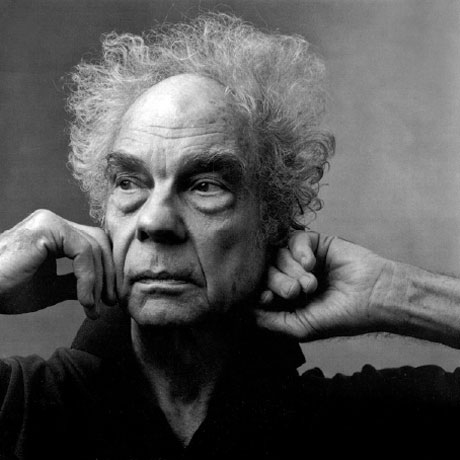 Renowned and revered equally for his revolutionary choreography and ground-breaking collaborations with contemporary visual artists and composers, Merce Cunningham will once again challenge—and entertain—audiences when the Merce Cunningham Dance Company returns to City Center, March 31-April 8. Expect two dramatically different premieres, a series of important revivals, as well as selections from Cunningham’s current hit list. The opening night will be celebrated with the world premiere of “Way Station,” a work for the full 16-member troupe. The dance has an original score, “Trilogy,” by the Company’s present music director Takehisa Kosugi, and decor by the young contemporary sculptor Charles Long. Also scheduled is “Summerspace,” which was first performed by the Company at the 1958 American Dance Festival. In 1966, the dance was set on the New York City Ballet, which first performed it at the New York State Theater. The famous color-flecked, Pointillist décor is by Robert Rauschenberg and the score, “Ixion,” is by Morton Feldman. The evening will also feature the revival of another Cunningham classic, “RainForest,” whose floating silver pillows by Andy Warhol have also been seen in many of the choreographer’s Events since the dance’s premiere in 1968. The music, also entitled “RainForest,” is by the late David Tudor. “BIPED,” Cunningham’s hit of the 1999 Lincoln Center Festival, will also be performed, along with his 1998 premiere, “Pond Way.“ A riveting, theatrical breakthrough work, “BIPED” explores and exploits new possibilities presented by motion capture technology. Paul Kaiser and Shelley Eshkar collaborated with Cunningham in transposing the dancers’ original movement into digital images to create the dance’s virtual choreography. The commissioned music for the dance, also entitled “BIPED,” is by Gavin Bryars, who will perform on keyboard and contra bass at City Center, along with electric guitarist James Woodrow. Suffused in a serene lyricism, “Pond Way,” which received its first performance in 1998, uses an original score by Brian Eno entitled “New Ikebukuro (for 3 CD players).” The décor, “Landscape with Boat,” is by Roy Lichtenstein, and the costumes are by the late Suzanne Gallo. Curtain times for the Merce Cunningham Dance Company’s performances at City Center are March 31 at 7pm; Tuesday through Saturday evening at 8pm. There will be 2pm matinees on both Saturday, April 7 and Sunday, April 8. Please note there will be no performance on Sunday, April 1 or Monday, April 2. Tickets for the City Center season, which range between $25 and $55, can be purchased through CITYTIX at 212.581.1212, or at the City Center box office. City Center is located at 131 West 55th Street (between Sixth and Seventh Avenues).